The nation of Israel was born in a struggle. Our patriarch Jacob wrestled with an angel in the form of a man. When he emerged victorious the angel changed Jacob's name to Israel, meaning "One who has wrestled with God" and said, "You have wrestled with God and with man and have prevailed." Ever since then the nation of Israel has been fighting for survival. The ancient people of Israel were a nation of warriors. The patriarch Abraham trained all the members of his household in combat, the sons of Jacob were fierce warriors and masters of the sword. The judges of Israel combined life wisdom with combat prowess; Ehud Ben Gerah was a master of the dagger, Deborah the Prophetess directed the strategy of battle, Samson slew the Philistines with the jawbone of a donkey. Young King David was a master of the slingshot. Modern Krav Maga is but a continuation of this ancient struggle. The people of Israel are still fighting for survival. 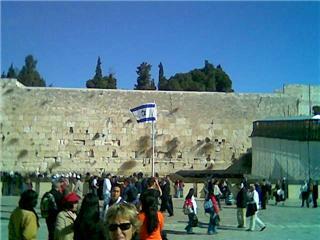 Jerusalem, the Western Wall, a remnant of our ancient Temple. The ancient Hebrew warrior has risen again. From the Warsaw Ghetto revolt to the partisans in the forests of Poland to the Israel Defense Forces Jews have followed the words of Ze'ev Vladimir Jabotinsky and have taken up arms to defend themselves. Krav Maga is the unarmed portion of combat; defense against guns, knives, sticks, and hand to hand combat. It is a simple, user friendly style, designed to meet the needs of modern self defense. Unlike traditional styles it is constantly being revised based on lessons learned on the battlefield, urban crime, and in combating terrorists. Our Krav techniques are constantly being evaluated and upgraded. Full contact training, and lessons drawn from real life cases, form the basis of our constant reevaluation. This keeps us on the cutting edge of reality training. We are innovators, not imitators. Our first time students, lacking any previous training, are often surprised at how easy it is to learn. IKI Krav Maga uses natural body movements to create techniques that are easy for the body to learn and retain and use in high stress situations. We use few techniques but apply them to many situations. Our Krav Maga students include men and women of all ages and from all over the world; college students, law enforcement, Military and Special Forces, Israeli police officers and front line soldiers, security personnel from Holland to Ukraine. We have students and branches all over the world. Many of our students are currently serving in the Israeli army as front line troops, tank commanders and combat instructors. We have seminars all over the world, Please see Seminar page for more information, or contact the IKI office. Krav Maga bedeutet übersetzt Nahkampf bzw. Kontaktkampf. Das Volk Israel wurde in einem Kampf „geboren“. Der Neffe Abrahams, Jacob , kämpfte mit einem Engel in Gestalt eines Mannes. Als Jakob den Kampf siegreich für sich entschied, sagte der Engel:“ von nun an sollst du Ysrael heißen… „der Mann der mit GOTT kämpfte“ (Ysra =kämpfen mit/gegen ; El = GOTT) Von Beginn an kämpfte das Volk Israel ums Überleben. Das alte Volk Israel war eine Nation von Kriegern. Der Patriarch Abraham trainierte alle Mitglieder seines Hauses im Nahkampf, die Söhne Jacobs waren gefürchtete Krieger und Meister des Schwerts. Die Richter Israels kombinierten Lebensweisheit mit Kampfkraft. Ehud Ben Gerah war ein Meister des Messerkampfes, die Prophetin Deborah führte Israel in die Schlacht und Samson besiegte die Philister mit einem Kieferknochen eines Esels. Das moderne Krav Maga ist die Weiterentwicklung aus diesen alten Kämpfen. Denn das Volk Israel kämpft auch heute noch ums Überleben. Die alten hebräischen Krieger sind wieder „auferstanden“. Von der Warschauer Ghetto-Revolution zu den Partisanenin den Wäldern von Polen, zu den Israelischen Verteidigungskräften. .. die Juden folgten den Worten Ze`ev Vladimir Jabotinsky und erhoben ihre Arme um sich selbst zu verteidigen. Krav Maga bezieht sich auf den unbewaffneten Teil des Kampfes: Verteidigung gegen Schusswaffen, Messer, Stöcke und den Waffenlosen Kampf – „Mann gegen Mann“. Krav Maga ist ein einfacher, „Anwenderfreundlicher“ Stil, gemacht für die heutigen Anforderungen der modernen Selbstverteidigung. Im Gegensatz zu Traditionellen Stilen wird es kontinuierlich verbessert, bzw. modifiziert. Dies geschieht mittels regelmäßiger Datenauswertungen aus Kampfeinsätzen und Anti Terror Kämpfen. Freude am Lernen In unseren Anfängerkursen sind die Teilnehmer oft sehr überrascht, wie einfach Krav Maga zu lernen ist. Krav Maga nutzt natürliche Körperbewegungen um Techniken zu schaffen die einfach auszuführen sind, man sich leicht merken kann und unter Stressbedingungen abrufen kann.